Leading mayoral candidate Abdul Algazali boasts that he's against tax increases. According to Wayne County property tax records, he may have taken that a step further. This could be a potential game changer in the mayoral election. 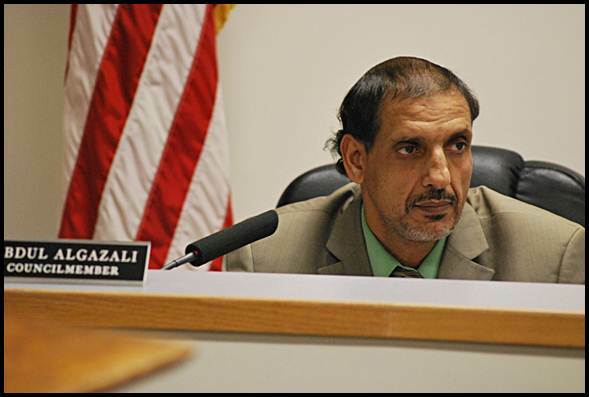 On Friday (Aug. 9), three days after Tuesday’s Primary Election, it came to The Review’s attention that leading mayoral candidate, Abdul Algazali, is apparently behind two years in property taxes for two buildings he owns on Jos. Campau. According to the Wayne County Treasurer’s online site, for the years 2011 and 2012 Algazali owes a total of $9,498 for his building at 9222 Jos. Campau. He owes another $2,819 for the same years at 8557 Jos. Campau. Both properties are “subject to foreclosure,” according to the county. Once you get to the page, scroll down to the box that says “pay property taxes” and click on online. You will then be asked two questions and hit “enter site” on the first page that comes up and “accept disclaimer” on the next page that appears. Once you get to the address finder page, type in the street address and for the street name type: jos campau (with no period after jos). So, how does any of this potentially alter the mayor’s race? The Review is in the process of finding out exactly how this will play out, legally, and left a message with the city attorney, who was out of the office when a call for comment was placed Friday afternoon. Algazali, who is a member of city council and is mayor pro tem, could not be reached for comment. The Review is also going to confirm the county’s online information on Monday at the Treasurer’s Office. Another lingering question is, if Algazali’s election results are thrown out, does that mean the third-place finisher, John Ulaj, automatically moves up to the number two spot to face-off with Mayor Karen Majewski in the November General Election ballot? Algazali, a chiropractor, has consistently voted against tax and fee increase proposals while on council, and in his campaign literature for the primary election prominently mentioned that. Stay tuned readers, we will have more to come on Monday. Behind in paying property taxes is not the same as “defaulting”. If I were a betting person I would bet a ton that those absentee votes for Mayor were for Algazali. Something stinks here in this election. We need an investigation !! What is the average absentee voter rate for Hamtramck. Is Algazeli really who he says he is. Time for some background check I’d say . A Ulaj who ran for a Mayoral seat and a broker can’t distinguish between “defaulter” and ” late taxes”. Are you kidding me? you are trying to be a Mayor! before that you need to have at least a base. Is that what you stayed digging for last three nights? to trick some people with some info from the county website. Wow. Can any one expect Ulaj to be a Mayor for the city while calling a majority of people of hamtramck DUM and don’t need their votes. I really think wanna be mayor Ulaj should go on with his life because after we all saw his attitude and his personality during his election campaign i don’t think he would ever get that number of votes again…… I wonder if the Hamtramck Review investigates Ulajs records, what would they find? A person who fails to fulfill a duty, obligation, or undertaking, esp. to pay a debt.